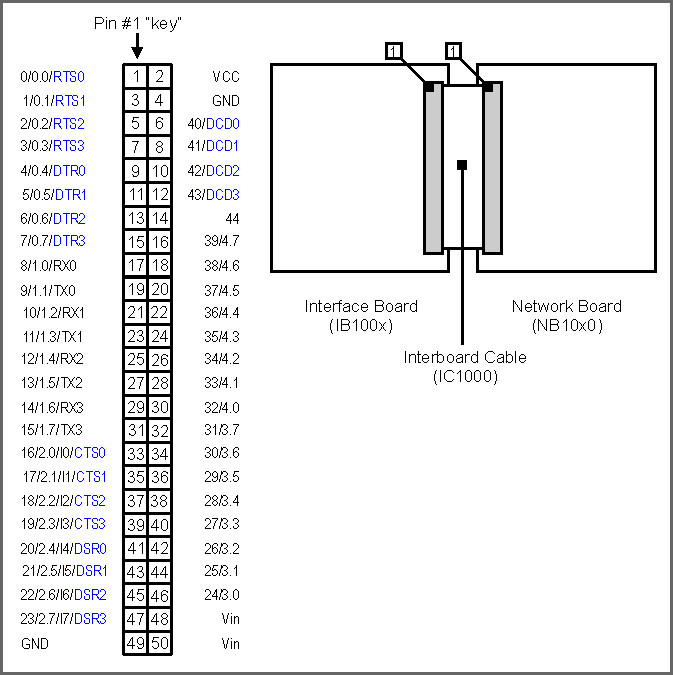 NB10x0 and IB100x boards are interconnected by a 50-wire cable called the "interboard cable". This cable can be ordered as IC1000. There is a 50-pin header on each board to receive the cable end. The header type is 2x25, pitch=2.54mm. Connector pin assignment is shown below. The IC1000 length is approximately 40mm (as measured between the connectors). This cable is supplied with each NB10x0 board (but not with IB100x boards). Note 1: indicated pin functions correspond to the pin functions of the EM1000 module (installed on the NB10x0 board). To save space, "GPIO" and "P" were omitted. For example, "17/2.1" actually means "GPIO17/P2.1". "I1" means "INT1". Note2: not all pin functions are shown. For example, pin #2 also has "W0out/cout0" functionality which is not shown on the diagram above. Refer to EM1000 documentation for complete pin function description.